Emperor penguins in Antarctica are far more plentiful than previously thought, a study that used extremely high-resolution imagery snapped by satellites has revealed. "It surprised us that we approximately doubled the population estimate," said Peter Fretwell, a scientist with the British Antarctic Survey and lead author of a paper published Friday in the journal PLoS One. Fretwell said that in contrast to previous estimates, which put emperor penguin numbers between 270,000 and 350,000 birds, the new research counted 595,000 birds. Antarctic research is challenging, since humans can essentially work on the frigid continent only for three months out of the year, and nailing down hard numbers for the iconic birds has proved difficult. The last overall population estimate, done in 1992, found that about 135,000 to 175,000 emperor penguins lived around the continent. Fretwell and a team of researchers melded several kinds of high-definition imagery captured by satellites to arrive at their new number. They sharpened the images to allow them to differentiate between penguins, shadows on the ground, and the penguins' poop, which is plentiful enough to show up in satellite pictures. The team also used actual ground counts of penguins in their analysis. "The ground counts told us the density of penguin clusters, and we used this to multiply the area of penguins calculated by our satellite image analysis into penguin numbers," Fretwell told OurAmazingPlanet in an email. The analysis not only doubled the previous estimate of emperor penguins, but also uncovered seven previously undiscovered colonies. Fretwell said this kind of research is important, particularly in the face of a changing climate. There are concerns that changes to Antarctica's ice heralds a difficult future for emperor penguins. The birds breed on the Antarctic sea ice during the brutal wimter months, but earlier spring melts may pose threats to the more northern colonies, according to a statement from the British Antarctic Survey. An emperor penguin colony in Antarctica, spied by satellite. A colony of emperor penguins stands out in the dramatic Antarctic landscape. Areas of Antarctica have experienced dramatic changes in recent years; floating ice shelves have crumbled away and glaciers have sped their march to the sea. The Antarctic Peninsula is one of the fastest-warming places on Earth, with air temperatures rising between 4 and 4.5 degrees Fahrenheit (2.2 and 2.5 degrees Celsius) in the last 50 years. Fretwell said the new technique provides at least one way to correlate any environmental changes with changes to emperor penguin numbers, and can be done year after year. "This first study gives us the baseline from which to calculate any future trend in the population dynamics. It is much cheaper that Antarctic fieldwork, so it gives us a cost-effective, consistent, comprehensive snapshot of the population each year," Fretwell said. 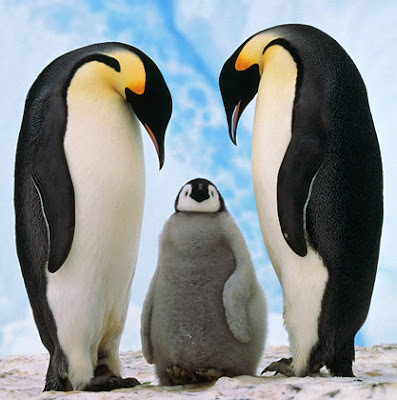 Emperor penguins, because of their stark black-and-white markings and their large size, stand out against the Antarctic ice. Similar work has proved difficult for smaller penguins. "Because they are smaller and breed on rock, rather than nice, white snow, it is more difficult, and we are still working on the technique," Fretwell said. Some scientists have attempted similar work on seals, he added. A study to estimate Arctic seal populations from airplanes is under way right now in the Bering Sea. "I imagine that there will be other species analyzed in a similar way in future," he said.